More and more people are using the internet each day - searching for exactly what your company offers. Having your business at the top of the search results means more leads, more sales, and more conversions. At BlueTone Media we understand that a business can be built or broken online. Our team spends the time to truly understand how your business works. In doing so, we develop a clear picture of exactly what your business goals are. From there, we develop a unique online marketing strategy that drives results. You will find many internet marketing companies out there who offer "out of the box" Wilmington SEO services. If a marketing company isn't going to spend the time to understand your company's goals, it is best to stay clear. In fact, nowadays, those "out of the box" techniques could get your website penalized by the search engines. Our internet marketing team has years of Wilmington SEO experience and we focus on making sure your website conforms to the multiple algorithm updates that occur each year. Our techniques are "white hat" and we follow the ever changing guidelines of the search engines. 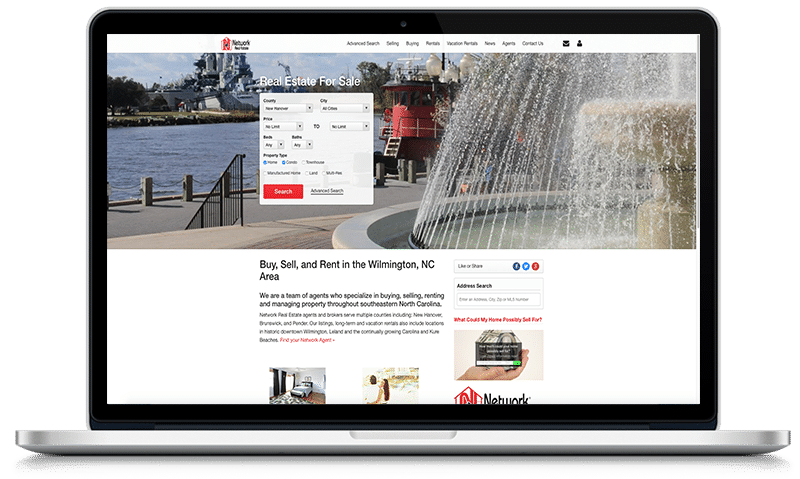 Goal: To provide an SEO Program that would raise the Network Realty website to Page 1 of the Search Engine Results Pages for Wilmington NC Rentals, Neighborhoods, & Real Estate related searches, competing with larger local Real Estate/Vacation Rental companies such as Bryant Real Estate, Sweyer Property Management, & Intracoastal Realty.